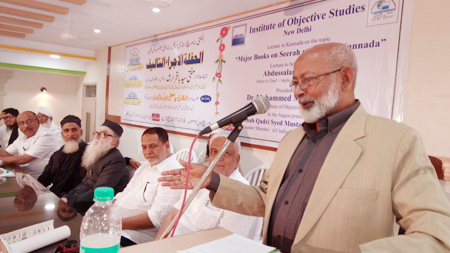 Bengaluru Dec, 9, 2017: The Institute of Objective Studies, New Delhi, organised a lecture on the subject "Major books of seerah written in Kannada". The lecture was delivered in Kannada by Abdussalam Puthige, editor-in-chief Kannada daily Vartha Bharthi at Darus Salam Building, Queens Road. Puthige said that efforts would be made for the introduction of Prophet Muhammad’s (PBUH) life in a larger way. 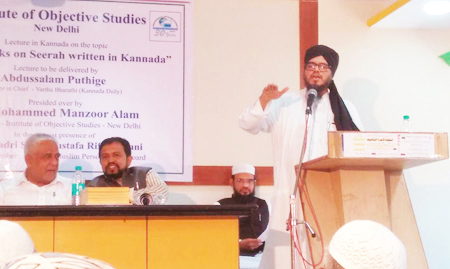 The Muslim community of Karnataka had been keeping a distance from the Kannada language, the result of which was insufficient number of books on seerah in Kannada. He emphasised that the life of Prophet Muhammad (PBUH) should not be seen or connected only with history or religion. The Prophet’s (PBUH) life is eternal, yet simple. The prophet’s life has example for every age. One could easily find examples in the daily life of the Prophet like keeping relations, speaking the truth, delivering justice, feeling the joy and pain of others. He said that no personality in the world had so much literature in all major languages written on him as Prophet Muhammad (PBUH). He said the Kannada language had given due importance to writing the life of Prophet Muhammad (PBUH), but a lot more had to be done. The situation, compared to the last century, was more conducive now to writing of seerah. Major books in Kannada on seerah (the life of Prophet Muhammad, PBUH) includes: Manava Kulada Vimochaka a 720-pages translation of Maulana Nayeem Siddiqui's Urdu book on seerah, Mohsin-e-Insaaniyat. It is the largest book available in Kannada regarding the life of the Prophet. He also gave a list of 35 books used often for reference. 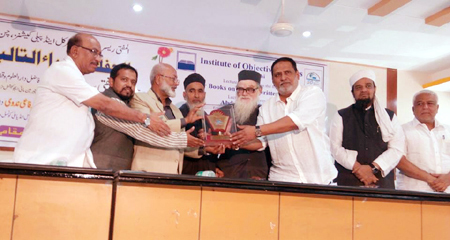 A synopsis of the lecture was presented in Urdu by Sulaiman Khan, vice-president, All India Milli Council, Karnataka. The programme was presided over by Dr Mohammad Manzoor Alam, Chairman IOS. He said that in the current era consistent efforts were made to damage the image of Prophet Muhammad (PBUH). This is the time when Muslims from every walk of life, especially the ulema, scholars and intellectuals, should reach the grassroots level to introduce the holy life of the Prophet (PBUH) in a correct way. 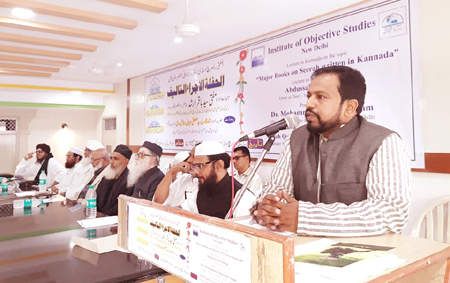 Dr. Alam said that by hearing Abdussalam Puthige's lecture “one can understand the fact that a drop of ink in a scholar's pen has more importance than a drop of blood of a mujahid". He presented an IOS 30 years celebration memento to Abdussalam Puthige. The progarmme was organised in collabration with Al Mufti Research & Publications, Channapatna , Karnataka. 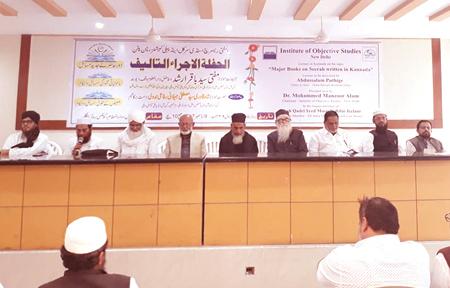 The second session of the programme saw the release of three Urdu books written by Mufti Syed Bakhar Arshad Qasmi: Daur-e-Haazir ke Jadeed Masayel, Zayeefon ke Huqooq, and Maholyati Aloodgi. Earlier, the programme began with recitation of a Quranic verse by Moulana Muzaffar Umari. Jameel Aahmed Milansaar, GA member IOS, welcomed the guests and the audience. 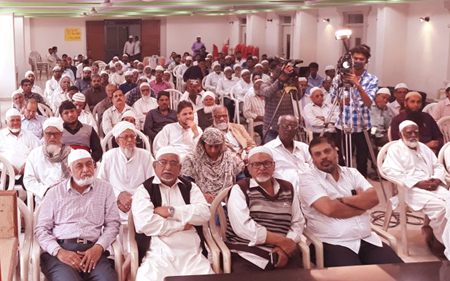 GA members IOS, Obaidulla Sharief and Aga Sultan, Maulana Syed Mustafa Rifai, Maulana Ameen Usmani, Syed Shahid Ahmed, Maulana Azhar Nadvi, Syed Mazhar Qadri and Hasan Ali Khan were among the prominent person present amid the large gathering.